Shinjuku Gyoen is one of Tokyo’s largest and most popular parks. Located just a short walk from Shinjuku Station, the paid park’s spacious lawns, meandering walking paths and tranquil scenery provide a relaxing escape from the busy urban center around it. 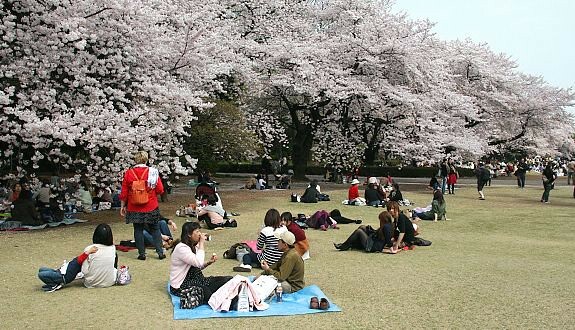 In spring Shinjuku Gyoen becomes one of the best places in the city to see cherry blossoms. Shinjuku Gyoen originated during the Edo Period (1603-1867) as a feudal lord’s Tokyo residence. Later it was converted into a botanical garden before being transferred to the Imperial Family in 1903 who used used it for recreation and the entertainment of guests. The park was almost completely destroyed during World War II, but was eventually rebuilt and reopened in 1949 as a public park. The park’s other main gardens include a symmetrically arranged formal French garden, and an English landscape garden featuring wide, open lawns surrounded by flowering cherry trees. The rest of the park consists of forested areas, lawns and several structures including a restaurant, an information center and an art gallery. 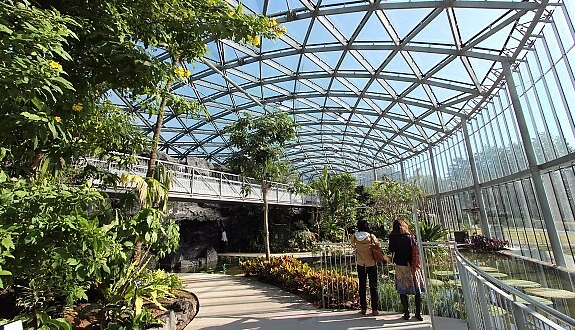 There is also a beautiful greenhouse with many tropical and subtropical flowers. Shinjuku Gyoen is home to a large number of cherry trees of more than a dozen different varieties. From late March to early April, more than 400 somei yoshino trees blossom around the English garden turning the lawns into one of Tokyo’s most popular and pleasant hanami spots. In addition, the park has numerous early and late blooming cherry trees which provide an extended cherry blossom viewing season (mid March to late April) for those who miss the main season. 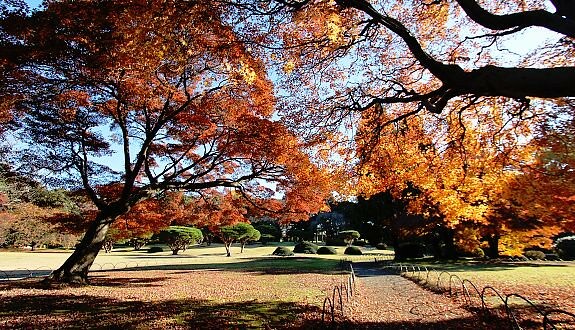 Shinjuku Gyoen is also nice to visit during autumn when the leaves change. There are a lot of different types of trees that change colors around the park, however the maple trees are particularly beautiful and can be seen in large numbers around the Japanese garden and Momijiyama (maple mountain) on the park’s eastern side. The colors typically appear from mid November to mid December.